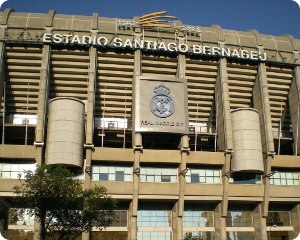 The Santiago Bernabéu Football Stadium is Real Madrid's home ground. It is a UEFA-classified Elite Stadium, awarded the top 5-star status in 2007. (Note: currently, stadiums are rated as category 1, 2, 3, or 4 (renamed from elite stadiums) in ascending ranking order. The Santiago Bernabéu is a Category 4). 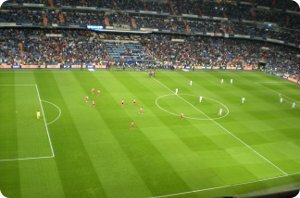 The Santiago Bernabéu Stadium and Real Madrid Football Club are closely associated. Some truly memorable football has been played within the walls of Santiago Bernabéu: UEFA Champions League, UEFA Europa League, Spain's Premier League or the 1982 FIFA World Cup (the final match was played here on 11 July 1982, between Italy and West Germany). The works started on a bare patch of ground on October 27th, 1944. The inauguration of the stadium, then called Chamartín Stadium (because it's located in Chamartín district), took place on 14 December 1947. Eight years later on January 4th, 1955, Real Madrid changed the name of the stadium to its current name in honor of Santiago Bernabéu, the club's president at the time. It has a current capacity of 85,454 spectators. While you expect a major refurbishment that will increase its capacity to 93,000 spectators, and It will become the third largest stadium in the world and one of the most modern. You will have the chance to look through the Stadium with no limits, and even have access to those places that you only had pictured in your mind. The Stadium is awaiting you with all its real myths, like the tunnel to the locker rooms, the bench, the pitch and even the presidential box. To round it off, you will visit the new Museum, the chief exponent of Real Madrid legend, the Best Club in the 20th Century. Route: Exhibition of Trophies, panoramic view of the stadium from the west side viewpoint and shop. Every day except December 25 and January 1. No match days: Monday to Saturday: 10:00 to 19:00. Sundays and Holidays: 10:30 to 18:30. Match days: Tour is open until 5 hours before kickoff (locker rooms closed). Until 2 hours before the game you can only visit the Exhibition of Trophies. * Line 10 - Santiago Bernabéu station.